A knife is used to produce a score (indentation) in thin sheet metal. 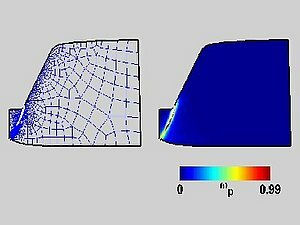 The simulation uses a coupled plasticity-damage model to predict damage and fracture of the sheet and remeshing to trace the resulting geometry changes. On the left the evolution of the mesh (including crack) is shown, whereas the right part shows the evolution of damage.